This study was conducted in order to define what constitutes color education in the undergraduate interior design curriculum. The study was also intended to assess students' knowledge of color upon completing their design education and preparing to enter the profession. The research for this study was conducted via the following: an evaluation of the curriculum of 96 accredited interior design programs and several course syllabi and supporting materials; a survey of final-year students regarding their views of color education; an interview with a former Council for Interior Design Accreditation (CIDA) site visitor to define criteria for assessing color proficiency in a design program; and a color exercise administered to final-year students to examine their practical color application skills. The study revealed that almost half of the evaluated interior design programs offer a color course. The majority of the courses cover more subject areas than color theory, including color psychology and the application of color. Interior design students generally lack the ability to appropriately apply color in design projects based on program requirements. Most interior design color courses focus primarily on color theory in instruction, exercises, and chosen texts. Color education is inconsistent among design programs and often does not cover the application of color in interiors. 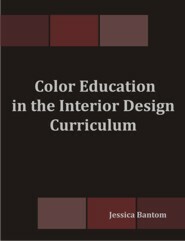 Color education standards are needed for the interior design curriculum. While color education is being addressed in interior design programs, it still requires evaluation and modification. Interior design students are being taught color but not in the context of interiors, which leaves them at a disadvantage upon entering design practice. This thesis includes a proposed syllabus for a course on applied color for interiors that introduces students to basic color concepts and how they can be applied in the interior environment. Jessica Bantom is a color consultant and president of Bantom Color Design, LLC. She is a member of the International Association of Color Consultants North America (IACCNA) and an allied member of the American Society of Interior Designers (ASID). She presented her graduate thesis on color education in the interior design curriculum at the 2008 annual Interior Design Educators Council (IDEC) Conference and is also a guest lecturer. She graduated with a B.A. degree from the University of Virginia and a M.A. degree in Interior Design from Marymount University.